Quick Instagram selfie in the bathroom. I was really tempted to open up the razor drop box to the right of the mirror but then I remembered it was probably just filled with rusty razor blades. At least here, the used razors would drop into a receptacle that could be emptied. Back in the day, razor slots would often just allow the used blades to drop into the space between the wall! There are lots of examples of this happening on Google if you're interested. Also, notice the "ring" around the mirror. 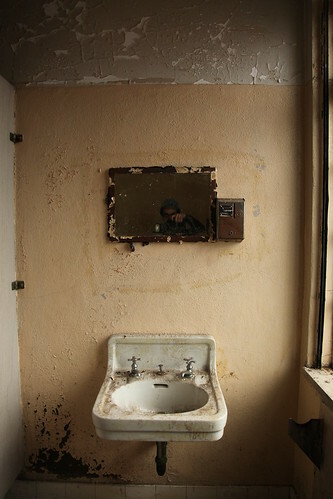 I wonder if this is perhaps an indication that at one time there was a larger mirror hanging on the wall? This mirror is awfully small and awfully high off the ground for a typical hospital bathroom.